As directed by Florida law, the District issues water use permits (WUPs), also known as consumptive use permits, that authorize water use. These permits allow users to withdraw a specified amount of water from surface and groundwater sources for reasonable and beneficial uses, such as public supply (drinking water), agricultural irrigation, landscape irrigation, industry, and power generation. Consumptive Uses of Water is regulated by Chapter 40A-2, Florida Administrative Code. Who Needs a Water Use Permit? For water use permitting purposes, the District is divided based on resource concern. There are areas within the District designated as Water Resource Caution Areas and Areas of Resource Concern. Unless exempted by law or rule, the District issues two types of water use permits for groundwater and surface water: Individual Water Use Permits and General Water Use Permits by rule. An individual permit is required for any use of water which is non-exempt and does not qualify for a General Water Use Permit by rule. If you are unsure whether your use qualifies for a General Water Use Permit by rule or needs an Individual Water Use Permit, District personnel are available to assist in the determination. 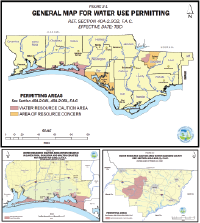 The Bureau of Groundwater Regulation can be contacted at (850) 539-5999. Water Well Contractors can view additional information on recent changes to the Water Use Permitting Program (40A-2 rule).